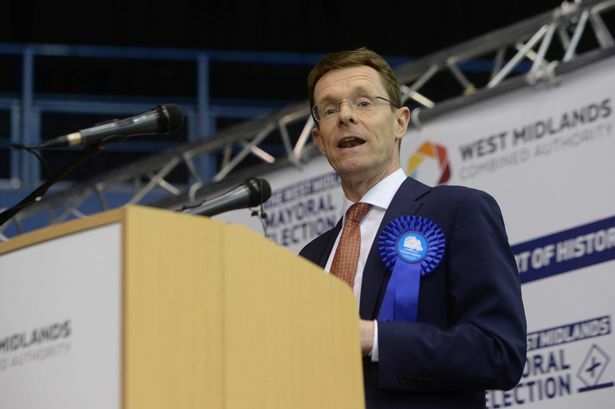 The gamble of giving up an £800,000-a-year boardroom job for front-line politics paid off for Conservative Andy Street in May after he was elected the first West Midlands Mayor. The retail executive stepped down from the top job at John Lewis last year and then fought a slick, £1 million campaign in a region previously dominated by Labour. It was a huge blow for Labour&apos;s candidate Siôn Simon, who famously stepped down from Parliament in 2010 to run for mayor of Birmingham and had high hopes of taking the top job in a region where Labour took 49 per cent of the vote in the 2016 police commissioner election. In all, Mr Street received 238,628 votes to Mr Simon&apos;s 234,862. Birmingham ground to a halt for two days in May after an unexploded, Second World War bomb was found on a construction site in Aston. Business leaders estimated that the closure of large parts of the city&apos;s transport network in order to make the area safe and eventually detonate the bomb could have cost companies a minimum of £6 million. There was gridlock across Birmingham with multiple roads on complete shut down while homes close to the Advanced Manufacturing Hub, in Aston Hall Road, were also evacuated. There was also major disruption to train services as commuters and shoppers had to find alternative routes into Birmingham or stay away altogether. Birmingham&apos;s historic Curzon Street station will be brought back to life with a visitor centre and education hub, under plans revealed this month. The Grade I-listed entrance building, which is the oldest surviving railway terminal in the world, has been disused for years but will be reborn as a focal point of the new site in Eastside which will eventually house the HS2 station. New proposals for the city council-owned site were revealed by HS2, the Government company set up to deliver the high-speed rail line between London and Birmingham. The aim is to carry out a full refurbishment of the 1830s building to create a visitor centre, meeting rooms, exhibition space and a café on the ground floor while upper floors are set to be used by Historic England and Birmingham City University&apos;s STEAMHouse project. The controversial Service Birmingham IT company set up by Birmingham City Council and Capita is being wound up three years early in a bid to save £43 million of taxpayers&apos; money. The joint venture, under which Capita ran the city&apos;s information and communication technology systems, council tax collection services and formerly ran its call centre, was set up in 2006. The contract was condemned as being far too expensive at its peak in 2011, costing the council £120 million a year at a time of cuts. It was announced in May that the council and Capita had agreed to end it by March 2018 and its 200 staff would be transferred back to the city council workforce. The council will continue to receive IT services from Capita until the scheduled end of the contract in 2021. Plans for a fourth residential project in the same Jewellery Quarter street were unveiled in May. Developer Property Solutions is eyeing a plot in Legge Lane to build 136 apartments and townhouses on a road already busy with development. The application site, which is bounded by Camden Drive and Camden Street, comprises disused land and a number of derelict buildings in a very poor state of repair. It follows three other apartment projects, all by separate developers, in Legge Lane. The Belfry hotel and golf resort is planning a major expansion which will create around 100 new jobs but see the end of the on-site nightclub Bel Air. The venue near Sutton Coldfield, famous for hosting the RyderCup golf tournament, outlined the proposals which include a new luxury spa and indoor pool and water park for guests. The plans also include a new 500-seat conference facility, which will be able to hold up to 700 guests for banqueting and ballroom functions, and an additional 112 hotel bedrooms. Seafood restaurant Lobster Peninsula suddenly closed down less than a year after opening. The grand eatery was among a flurry of new restaurants to open during 2016 in what was a very busy year for Birmingham&apos;s food and drink scene. Housed in the historic Futurist Cinema in John Bright Street, the restaurant opened in November 2016 after an investment of nearly £1 million. But it announced via Twitter in May that "due to unforeseen circumstances" it had to close. One of Birmingham&apos;s most run-down and derelict city centre buildings will be replaced with a huge retail and residential development. Monaco House, in Bristol Street, will make way for a £275 million scheme containing more than 1,000 apartments and townhouses alongside ground floor shops and public space. Details of the project, to be called &apos;New Monaco&apos;, were unveiled in May and a full planning application was lodged in December. If given the green light, it will become one of the largest residential estates ever developed in the city centre and will neighbour two other major schemes in Bristol Street - the nearly completed Park Central and Barratt Homes&apos; plans for the old Matthew Boulton College site.